We’d love your help. 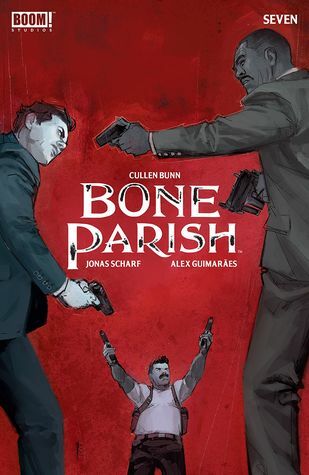 Let us know what’s wrong with this preview of Bone Parish #7 by Cullen Bunn. To ask other readers questions about Bone Parish #7, please sign up. They have done such a good job setting up this series. There is so much tension at this point. Everybody involved has their own motivations and goals, and even when we’re clearly shown them…it’s still so easy to forget their ulterior motives. It’s brilliantly done. The threats shown in this issue were…just wow. I can’t imagine having to deal with something on that level. I honestly don’t know how I would react. As for the rest of the plot. It’s been really interesting to see how the other famil They have done such a good job setting up this series. There is so much tension at this point. Everybody involved has their own motivations and goals, and even when we’re clearly shown them…it’s still so easy to forget their ulterior motives. It’s brilliantly done. The ash seems like such a neat premise, but the things about it that the team behind this title wants to show are not the things about it that I as a reader want to learn. I think it's a good title, but it's not what I wanted from it, and it's time for me to move on. If this isn't an issue that makes you say WTF, I dunno what will. One of the best comics going today!! Cullen grew up in rural North Carolina, but now lives in the St. Louis area with his wife Cindy and his son Jackson. His noir/horror comic (and first collaboration with Brian Hurtt), The Damned, was published in 2007 by Oni Press. The follow-up, The Damned: Prodigal Sons, was released in 2008. In addition to The Sixth Gun, his current projects include Crooked Hills, a middle reader horror prose se Cullen grew up in rural North Carolina, but now lives in the St. Louis area with his wife Cindy and his son Jackson. His noir/horror comic (and first collaboration with Brian Hurtt), The Damned, was published in 2007 by Oni Press. The follow-up, The Damned: Prodigal Sons, was released in 2008. In addition to The Sixth Gun, his current projects include Crooked Hills, a middle reader horror prose series from Evileye Books; The Tooth, an original graphic novel from Oni Press; and various work for Marvel and DC. Somewhere along the way, Cullen founded Undaunted Press and edited the critically acclaimed small press horror magazine, Whispers from the Shattered Forum.